Ever since I became interested in fine chocolate, I’ve searched the web high and low to find suppliers in Belgium. Conclusion after an intensive search? There aren’t that many around… Hardly any in fact. 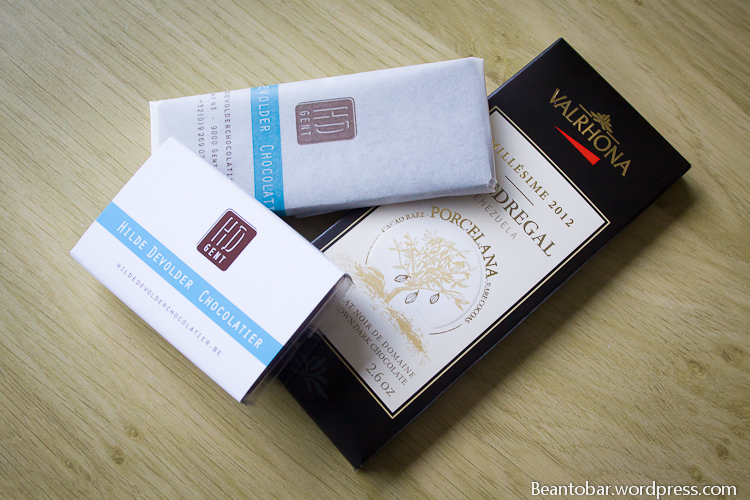 As part of the search I started out to check local chocolatiers. These chocolate producers don’t make bean-to-bar products, but rather buy in chocolate wich they transform into pralines and other sweets. 99% of the Belgian chocolatiers announce with great pride that they use Callebaut chocolate, the best of the best. Well, not really. It’s all very generic chocolate, sweet, sweet, sweet. They are nice, but there has to be better out there, doesn’t it? And it does. Suddenly I stumbled upon the Facebook page of HD Ghent – owned by Hilde Devolder. She does make a line of pralines, just like the rest. But I noticed she had a Valrhona sign up in the shop. Valrhona, one of the most renowned fine chocolate makers in France. she is someone who has a heart for fine chocolate. Last Friday I went into the shop. And what a wonderful world you step into. 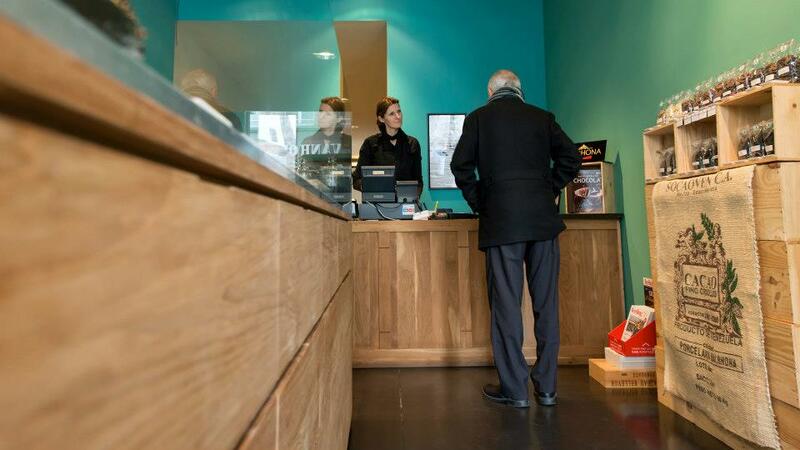 A nice big wooden counter in a fresh looking design. An amazing looking workshop beyond the counter. Then you turn around and you are overwhelmed by the amazing array of displays. Dozens of sleek-looking bags hiding very attractive orangettes, chocolate covered coffee beans, several stands with bean-to-bar chocolates, a whole Valrhona bar display, books about chocolate… and in the center of it all… a counter filled with delicate looking pralines. This certainly isn’t your average tourist oriented Belgian chocolatier shop! I had hardly enough time to discover all of the beauty inside the shop as I was on a tight schedule, but Hilde helped me to find the things I came for. The chocolats will be reviewed later on this blog, you can count on that! The most important reason I choose to visit the shop last friday, is that Hilde produces several pralines that don’t contain lactose and/or gluten. As my wife is non-tolerant to neither, it was fantastic to finally discover a supplier who offers pralines she can eat safely. I don’t think many people will truly understand what lactose/gluten intolerant people have to give up in their live. Giving it back to them is very rewarding! So all my respect goes to people who take time and effort in making lactose/gluten-free products that don’t compromise in taste or quality. 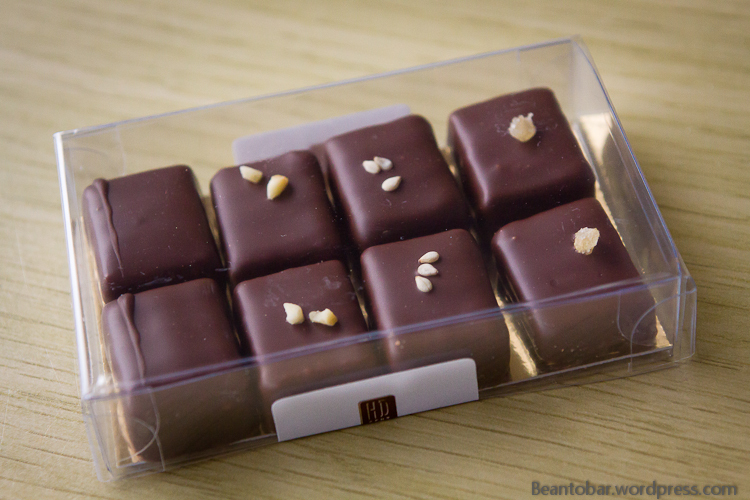 Hilde’s pralines look small compared to other manufacturer’s, but they just show class and refinement all over. These perfect little blocks produce such a tempting aroma when you open lid of the box that hides them. 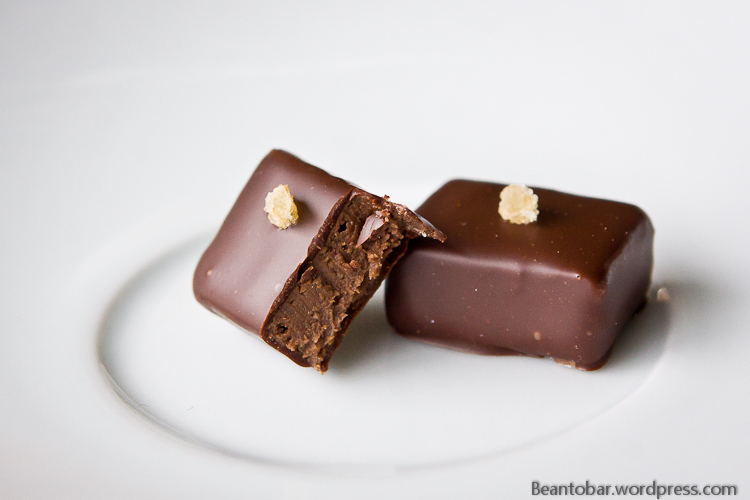 Biting them, reveals a gorgeous praliné inside, infused with so many different tastes. In the gluten/lactose free versions, for instance ginger, marzipan, sesame, cranberry, etc. These little pralines are sweet, without being to sticky, they melt slowly in your mouth releasing their delicate aromas, combined with the powerful hints of the fine Valrhona/Luker combination chocolate they are enrobed in. Delicate moments of pure tasting pleasure. I’m hoping to get more into detail about these beauties soon, when I get my own stash. 🙂 And trust me, I will get my own! 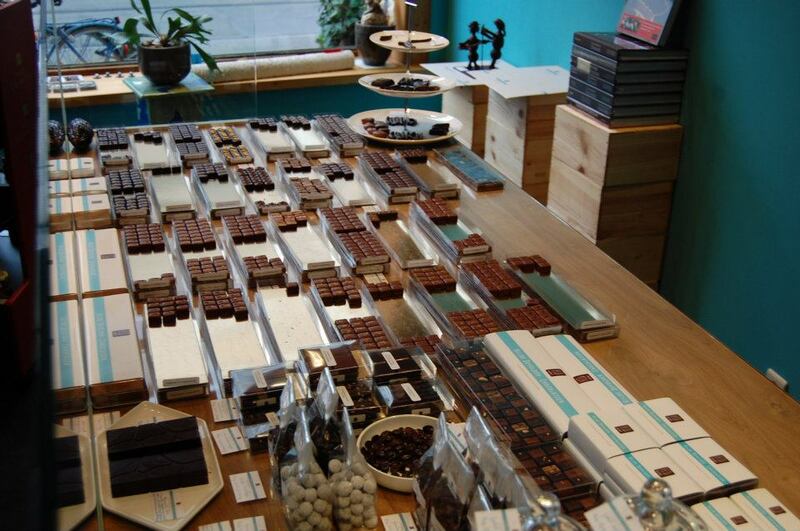 The shop is a must visit if you like good chocolate and are in the area of Ghent, Belgium! Mooie review Kris! Ik ga daar af en toe zelf en kan alleen jouw bevindingen beamen. Naast HD is er ook jazzcafé Het Onverwacht Geluk, en daar lever ik een tiental whisky en rums, ideaal voor een aperitiefje na een bezoek aan Hilde ;-)!